Sofia Milos before and after plastic surgery, nose job, breast implants. Here we see actress and former model, Sofia Milos, known for her role in the television series CSI: Miami, with appearances in the movie Passionada and The Order. 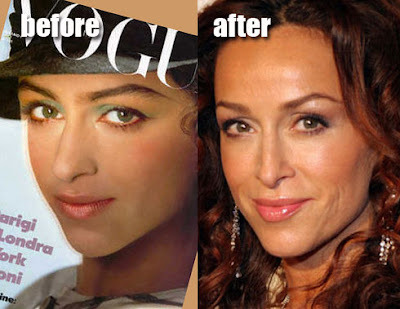 As you can see in this before and after photo, Sofia Milos once graced the cover of Vogue magazine while looking quite differently than her current appearance, and its believed by many that at some point Sofia Milos underwent a nose job procedure which drastically reduced the size and shape of her tip. Similar to the hook shape we've seen with Paris Hilton's nose job. And rhinoplasty plastic surgery isn't the only rumored operation Ms Milos has undergone, recent photos of the actress would suggest she has a fresh pair of breast implants and more than a few botox injections. With botched plastic surgery on the rise, it would seem like the risk would be too great for these already beautiful celebrities to jeopardize their livelihood with unnecessary procedures. I for one think Sofia Milos had a tremendously beautiful nose while on the cover of Vogue magazine. Lets hear your thoughts on the topic of Sofia Milos. These look like bolted on her. always loved this woman ...still do... the surgeries look fine...even love the bolt ons... she has the beauty to pull it off.